When a newborns show signs of brain injury or neonatal encephalopathy, they will most likely be admitted to the NICU for close observation. Neonatal seizures are often the first and only clinical sign of brain injury in babies. The most common cause of seizures in a newborn is hypoxic-ischemic encephalopathy (HIE). Seizures caused by HIE or other brain injuries usually start within the first 24 – 48 hours of birth. Babies with seizures should be promptly evaluated for HIE. Seizures must also be quickly treated because they can cause problems with the body’s regulatory functions and affect breathing, temperature and oxygen uptake. Seizures can also worsen existing brain injury and cause further permanent brain damage. Neonatal seizures are associated with HIE, cerebral palsy, intellectual disabilities and developmental delays. Hypoxic-ischemic encephalopathy and seizures must be immediately diagnosed because there are treatments available for both conditions. If left untreated, seizures and HIE can cause permanent and severe brain damage. Treatment for HIE is only available within a 6 hour window following the insult that caused the HIE. Since HIE in a newborn is often caused by an injury occurring during or near the time of birth, a diagnosis must usually occur within the first 6 hours of the baby’s life. Treatment of HIE may also help prevent future seizures and resultant epilepsy in the child. Many NICUs are now able to perform continuous EEG monitoring. This is very important since there are often no outward signs that a baby is having a seizure. If the NICU does not have continuous EEG monitoring, frequent EEG monitoring of all babies suspected of having HIE or another type of brain injury should take place. Once seizures are diagnosed, the physician will try to determine the underlying cause. If the underlying cause is HIE or another type of brain injury, anti-seizure medication will likely be given. What Are the Causes of Neonatal Seizures? A seizure is a sudden disruption of the brain’s normal electrical activity. The abnormal electrical activity is accompanied by altered consciousness and other signs of brain dysfunction. Seizures can be caused by brain damage, hypoglycemia, metabolic problems and other conditions that affect brain activity. Thus, the longer the seizure activity is left undiagnosed and untreated, the greater the potential for permanent brain damage in the baby. Decide whether to initiate antiepileptic drug (AED) therapy. Factors to be taken into consideration in deciding whether to initiate AED therapy include whether the seizure is epileptic in origin. If it is, seizure duration and severity must be examined. The way it works is well understood for term and preterm infants. Phenobarbital is eliminated by the liver and kidneys. Therefore, if a newborn has impaired kidney or liver function (which often is the case with HIE), the standard dose of the drug could be toxic. The younger the baby, the higher the likelihood of toxicity. When seizures are unresponsive to AEDs, pyridozine (a B vitamin) should be given to the baby. If there is no response to this, folic acid (B9) can also be given. Determining the underlying cause of seizures is very important because oftentimes, drugs will not be effective in controlling seizure activity until the underlying cause is treated. Furthermore, the medical team must make every effort to prevent seizures and minimize seizure activity and severity. Very close monitoring must also occur if AED therapy is given to the baby. This treatment can be dangerous. In addition to standard monitoring, medical professionals should monitor blood levels of the drugs being administered, as well as liver and kidney function. What is HIE (Hypoxic-Ischemic Encephalopathy)? Umbilical cord, placenta and uterus problems: The uterus (womb), placenta and umbilical cord are very important in delivering oxygen to the baby. Oxygen-rich blood from the mother travels through vessels in the uterus and placenta (called uteroplacental circulation), and then to the baby through the umbilical cord. When complications (such as placental abruption, uterine rupture or nuchal cord)occur that affect blood flow to the baby, the baby can become severely and even completely cut off from oxygen supply. Hyperstimulation caused by labor drugs: Pitocin and Cytotec can cause contractions to be so strong and frequent (hyperstimulation) that the placenta is unable to properly recharge with a fresh supply of oxygen-rich blood for the baby. This can cause oxygen deprivation that gets progressively worse. Hyperstimulation also increases the baby’s risk of having a brain bleed. Brain bleeds, clots and strokes caused by vacuum extractors, forceps and trauma during delivery: Use of delivery devices (forceps and vacuum extractors) place a baby at risk of suffering brain bleeds and hemorrhages because they attach to the baby’s head and are used to pull the baby out of the birth canal. If a baby is too large for the size of the birth canal (cephalopelvic disproportion (CPD)), vaginal delivery is impossible. Attempts to deliver this way can cause severe trauma and brain bleeds in the baby. Gestational diabetes places a baby at risk of growing very large (macrosomic). Not only does macrosomia increase the baby’s risk of experiencing a traumatic delivery, but it also increases the risk of shoulder dystocia(when the baby’s shoulder gets stuck on the mother’s pelvic bone). Macrosomia and shoulder dystocia increase the chance that physicians will use forceps and vacuum extractors during delivery. When these conditions occur, a C-section delivery is often the fastest and safest way to deliver the baby. These conditions can have very serious consequences for the baby, including hypoxic-ischemic encephalopathy (HIE), seizures, cerebral palsy and epilepsy. However, if the medical team closely monitors the baby’s heart rate with the fetal heart monitor, signs of oxygen deprivation in the baby, called fetal distress, can be recognized right away and the physician can quickly deliver the baby to get her out of the oxygen depriving conditions. Most often, an emergency C-section is performed when fetal distress is present. Medical management of the baby after the brain insult. The only treatment for hypoxic-ischemic encephalopathy is hypothermia therapy (brain cooling), where medical staff use a cooling cap or cooling blanket to cool the baby’s core body temperature to a few degrees below normal for 72 hours. The key with hypothermia treatment is that it must be given within 6 hours of the insult to the brain that caused the baby’s HIE. The more severe the HIE, the sooner the treatment should be given. Hypothermia treatment has been shown to lessen the injurious processes that starts to occur when the brain experiences an oxygen depriving/ischemic insult. Studies show that hypothermia treatment significantly decreases the baby’s chance of developing cerebral palsy, and the treatment can also decrease the severity of the cerebral palsy. How Does Hypoxic-Ischemic Encephalopathy / HIE Cause Seizures? When HIE occurs, there is a series of events that cause a decrease in energy production in the brain, which can cause over-excitation of brain impulses and resultant seizures. Since hypothermia treatment can decrease the amount of brain damage that occurs after a hypoxic / ischemic insult, the treatment may be able to help prevent seizures. 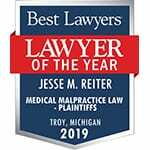 Reiter & Walsh ABC Law Centers is a national birth injury law firm that has been helping children since 1997. If your child was diagnosed with a birth injury, such as cerebral palsy, seizure disorders or HIE, the birth injury attorneys at ABC Law Centers can help. We have helped children throughout the country obtain compensation for lifelong treatment, therapy and a secure future. Chapman KE, Mizrahi EM, Clancy, RR. Neonatal seizures. In: Wyllie’s Treatment of Epilepsy: Principles and Practice, 5th, Lippincott, Williams & Wilkens, Philadelphia. Lynch NE, Stevenson NJ, Livingstone V, et al. The temporal evolution of electrographic seizure burden in neonatal hypoxic ischemic encephalopathy. Epilepsia 2012; 53:549. Scher MS, Aso K, Beggarly ME, et al. Electrographic seizures in preterm and full-term neonates: clinical correlates, associated brain lesions, and risk for neurologic sequelae. Pediatrics 1993; 91:128. Glass HC, Pham TN, Danielsen B, et al. Antenatal and intrapartum risk factors for seizures in term newborns: a population-based study, California 1998-2002. J Pediatr 2009; 154:24. Levy, RA, Mattson, RH, Meldrum, BS, Perucca, E (Eds), Antiepileptic Drugs, 4th ed, Raven Press, New York 1995.